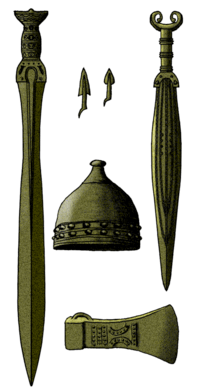 The Bronze Age is the time period when people made tools from an alloy (a mixture of metals) called bronze. Bronze is a mixture of mainly copper and tin: usually nine parts copper to one part tin. Materials like wood and stone were also used for tools, but bronze was better for cutting and chopping, and was easy to shape. 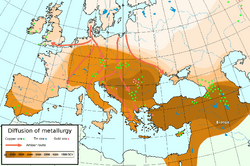 The Bronze Age was not at the same time everywhere, because different groups of people began to use bronze at different times. 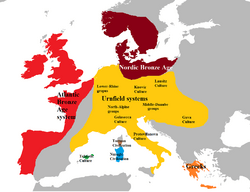 In Western Europe, the Bronze Age lasted from about 2000 BC until 800 BC. In the Middle East, it started about a thousand years earlier. For example, bronze was first used in Mesopotamia around 3300 BC. Archaeologists think that people became more organised in the Bronze Age, because the making of metal tools was difficult and needed certain skills. The people who had these new skills would have been important. 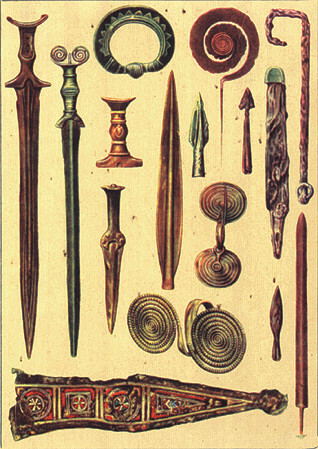 The new metal tools were bought, sold, or traded across larger distances. Later, when iron tools spread, the Bronze Age ended and the Iron Age started. A reason for iron replacing bronze is that tin ore, a rock in which tin may be found, is much more rare than iron ore. Copper tools were not useful because they were too soft. Agricultural scene from Ancient Egypt. By the Bronze Age, wild food was no longer a main part of the diet. The title "inventors of agriculture" might go to the Sumerians, starting c. 5500 BC. Farming allows more people in an area than can be supported by hunting and gathering. Crops can be stored for off-season use, or to sell or barter. Farmers could feed people to do other things than agriculture. This was a crucial factor in the rise of full-time armies. Sumerian agriculture allowed them to win battles and land. This made them early empire builders. 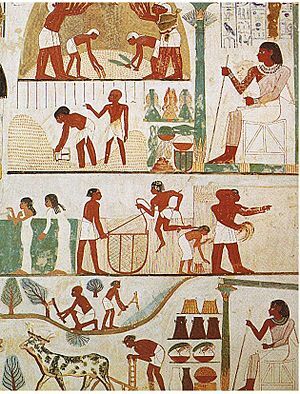 Not long after, the Egyptians, farming in the fertile Nile valley, increased their population. There were now enough warriors for a territorial expansion more than tripling the Sumerian empire in area. In Sumer, barley was the primary crop; wheat, flax, dates, apples, plums, and grapes were grown as well. Mesopotamian agriculture was both supported and limited by flooding of the Tigris and Euphrates rivers. Floods came in late spring or early summer from snow melting from the Anatolian mountains. Sheep and goats were domesticated, kept mainly for meat, milk, butter and cheese. Ur, a large town that covered about 50 acres (20 hectares), kept 10,000 animals; 3,000 were slaughtered every year. The city's population of 6,000 included a labour force of 2,500, cultivated 3,000 acres (12 km²) of land. The labour force included storehouse recorders, work foremen, overseers, and harvest supervisors as well as labourers. The land was plowed by teams of oxen pulling light unwheeled plows and grain was harvested with sickle. Wagons had solid wheels covered by leather tires kept in position by copper nails and were drawn by oxen. As many as four animals could pull a wagon at one time. The horse was domesticated in Ukraine around 4000 BC, and was in use by the Sumerians around 2000 BC. 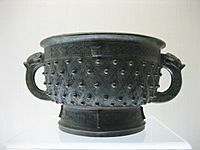 Late Bronze Age wine vessel from China. Bronze mirror with a female human figure at the base, Eighteenth dynasty of Egypt (1540–1296 BC). Ceremonial giant dirk (1500–1300 BC). Assorted Celtic bronze castings dating from the Bronze Age. Bronze Age Facts for Kids. Kiddle Encyclopedia. 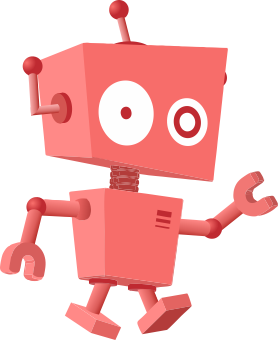 This page was last modified on 23 April 2019, at 02:26.